– The gingiva is the pale pink soft tissue covering the bone and the teeth. There are two ways that gum disease is often described. The first is called gingivitis and the other is periodontitis. It is an inflammation or swelling of the gums and, if it becomes serious, it can mean the tissue surrounding the teeth may be lost. There are a few ways to treat periodontitis and the choice will mainly depend on its severity. The main goal of periodontitis treatment is to completely remove any bacteria, which will stop further damage and to create an oral environment that the person can look after. Treatment can be performed by a dentist, but daily oral care will solve some of the basic problems as well. Treatment is most successful when a daily routine of good oral care is followed. One method used by dentists is called scaling and this removes any tartar and bacteria from the surface of the teeth and from under the gums. Often, hand instruments are used, but there is an ultrasonic device available too. Another method is root planing, which smooths the root surfaces and, in the process, discourages further tartar build up. For certain gum diseases it may be necessary to use topical antibiotics. If these are not effective, then oral antibiotics may be required to arrest infections. If the periodontitis is advanced, your gum tissue may not react favorably to non-surgical treatment and good oral hygiene. If this be the case, periodontitis treatment could need dental surgery, such as flap surgery. In this procedure, the periodontist will make small incisions in the gum so that a section of gum tissue can be folded back. This exposes the roots so that better planing and scaling can take place. Soft tissue grafts may be used when gum tissue is lost due to periodontal disease, the gum line recedes, which makes the teeth look longer than usual. The damaged tissue may need to be replaced by taking a small quantity of tissue from the palate and attaching it to the area that is affected. This can stop further gum recession and improve the overall appearance of the teeth. 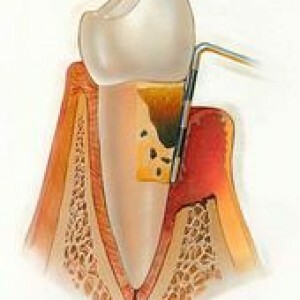 Bone grafting is used when periodontitis has destroyed the bone around the tooth root. It helps to prevent the loss of a tooth by holding it in place. Guided tissue regrowth allows the bone that has been destroyed by bacteria to regrow. The dentist positions a piece of bone graft material and/or membrane between the tooth and the existing bone. This material stops undesirable tissue from getting into the healing area so that the bone can grow back. Another method sometimes used involves putting specialized gel onto the root of a diseased tooth. The gel is made up of the same proteins that can be found in tooth enamel and serves to stimulate the further growth of healthy tissue and bone. The calculus is the mineralized debris that accumulates on the teeth, gums and tongue due to the poor oral hygiene. The minerals in the saliva contribute to the formation of the calculus. However, if oral hygiene is good then the soft debris on the teeth can be removed by proper brushing and flossing, no tartar and calculus is seen in the oral cavity. Because it is mineralized, once it is formed, it cannot be removed with home care. Professional teeth cleaning in a dental office is necessary. Otherwise, it causes the gum disease and further bone loss.